Save £100 And More Off Laptops and Desktop PCs in the Clearance at Ebuyer Take a look at the fantastic savings available in the eBuyer clearance - don't miss out, once they're gone, they're gone! Discover 40% Off Electronics in the Daily Deals at Ebuyer Check out the daily deals at Ebuyer to save up to 40% on electricals, including gaming headsets, monitors, printers, and more. £100 Off Selected Apple MacBooks and Laptops Plus Free Delivery at Ebuyer Make the Apple MacBook your next laptop of choice. You'll save up to £100 through Ebuyer! £100 Off Selected Desktops at Ebuyer Upgrade your desktop at Ebuyer with £100 off some powerful high-spec models. Find 20% Off Selected USB Sticks at Ebuyer Whether keeping confidential files secure for work or looking to bring a few movies on a holiday, save yourself hassle and money by grabbing a discount USB stick from Ebuyer. Up to 20% Off Selected Laptops at Ebuyer Invest in a new laptop without hurting your bank balance. At Ebuyer, you could save up to 20% on top-of-the-range laptops. Get 50% Off Gaming Laptops Plus Free Delivery at Ebuyer Play your favourite games in the best quality with a new gaming laptop! Head to Ebuyer and find 50% off selected models. Enjoy £150 And More Off Selected TVs at Ebuyer Experience the wonder of high definition with a TV upgrade by world-leading tech brands like LG, Samsung, and Sony. Up to 25% Off Selected Monitors at Ebuyer Looking to upgrade your computer monitor? Make sure you choose right at Ebuyer. Whether you’re browsing for specialist electronics, hunting for a new DVD player or state-of-the-art TV, at Ebuyer.com you will find a wonderfully wide selection of goods across a mighty range of categories. Shop computing, Components, Network & Storage and more - here you can update every area of the home and your office or business with the goods that are on offer. Browse today to save on everything from a monitor and audio headset to a Smart Home Hub and Wifi extender. This goes further than the humble laptop, and as experts in the field of electronics, you can be sure to only find quality goods and the latest technology that's on the market. 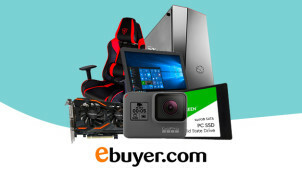 The team at Ebuyer.com know that with such an array of products, it can be tricky deciding which one will be right for you. So when it comes to choosing your memory, router and even just ink and toner - Ebuyer.com will give you the lowdown about the different options available. They'll even show you their recommendations on the product pages. so now you can really engage with your gadgets and gizmos when you shop with Ebuyer.com. How do I use my Ebuyer promo code? Click ‘Apply’ to update your basket and then continue to checkout and complete your order. For knocked down prices on quality goods, checkout the Clearance Store to see what you could find! It may be that items were previous display goods, refurbished or with slight cosmetic defects, however, every item will still be in fine working order and will come with a 90 -day warranty just to give you peace of mind. You can easily do this with your order number and postcode online. When is the Ebuyer.com sale? There will be seasonal sales, meanwhile, you can shop the daily deals page to bag yourself a bargain whenever you please! Am I able to pay for my goods on finance? You can pay by Visa, Mastercard or Maestro as well as by using PayPay or by using one of their Finance options to help spread the cost of your new equipment using regular monthly payments. How will I know if my item is out of stock? Should there be any issues with stock or if an item has been discontinued, you will be informed via email and allowed to take any action such as re-ordering another item. Standard Delivery is Free for Orders over £50 - arrives within 5 working days. Next Working Day Delivery starts at £6.99 - order by 6pm. Delivery costs vary depending on the weight of your parcel - and on a sliding scale for delivery times. This lets you, rather generously, handpick a price that suits you! Click and Collect is also available for £1.98 - and available for any Collect+ location. To start a return, sign in to your eBuyer account and follow the process from there. You can also reach eBuyer online via their eNotes section. Take the hassle out of shopping for the tech and electronics that you need with Ebuyer.com. With over 40,000 high-quality products on offer, Ebuyer has always been that brand at the forefront of this industry. Now with a Ebuyer promo code you will be guaranteed a trusted service and the lowest prices. So for the home and the business, for a new laptop, PC or even office supplies - Ebuyer is the place to be. Make waiting for your delivery a thing of the past with the Next Working Day delivery available from Ebuyer. Don’t sit at the window for days waiting for the courier to come, get it in a day with the fast, reliable Ebuyerservice. You can even get next day delivery when ordering up to 11pm - perfect for those late night bursts of inspiration. Don’t forget to check vouchercloud for Ebuyer next day delivery discount codes! Up your game at Ebuyer this summer with the amazing gaming hardware available instore. You could make this year the year you finally upgrade your gaming PC to your exact spec and invest in all the extras. Shop with an Ebuyer discount code from vouchercloud to get money off your powerful new creation and go all guns (or swords, or arrows, or magic spells) blazing!